MTS’s TEM Suite platform offers a fully integrated software suite and set of outsourced services that provide enterprises the ability to comprehensively manage their current and planned communications environments. 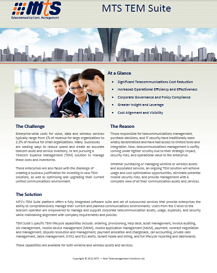 Users from the C‐level to the telecom operator are empowered to manage and support corporate telecommunication assets, usage, expenses, and security while maintaining alignment with company requirements and policies. Download our Datasheet or call us at +1-201-421-2260 for more information.